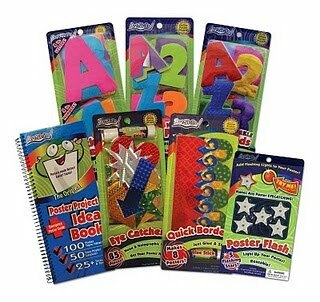 At ArtSkills we make a wide range of art materials. We specialize in posterboard accessories, including poster markers, poster lettering, and decorative items to make your poster board projects better, faster, and easier!It is our goal to be your source for everything you need to make a poster! We value the trust our customers put in us and continue to strive to bring new and innovative poster products and ideas to you. We know this image may be all too familiar to you... we are here to help! B will be starting school this coming week. The one thing that I know for certain is at some point a poster project is inevitable. When I was younger and still in grade school I have fond memories of project making ( yes I actually enjoyed it ). There were never any great creative options like the one's that ArtSkills offers, so at times my projects were lacking. We were excited to have the opportunity to try out some of the great poster making tools that ArtSkills offers. We used the Quick Letter Pads to make a great Alphabet Poster for B & the Princess. We decorated it with Poster Flash ( Battery Operated Flashing Stars!) and they finished it by adding some of creative pictures for each letter of the Alphabet. With the Quick Letter Pad, and Poster Flash, this poster was just that Quick and enjoyable to make. The kids had a great time, and I had a great time assisting them. I know that if a poster project arises this school year, Art Skills poster making products will make it fun & easy to create a better poster presentation! You can find ArtSkills products at a retailer near you! Leave a comment~ Have you or your child had a bad poster making experience? How do you think that ArtSkills Poster making products will make your child's poster presentation's better this year?